We walked alongside the settler road between Deir Istiya and Haris, which connects numerous illegal settlements in Salfit and Qalqiliya regions with the so called Highway 5, the main commuter route for the illegal settlers working in Israel. Earlier on, we chatted with our neighbor, asking him for the latest Deir Istiya news. He told us that work started couple of months ago on an additional lane and a roundabout on the 2 lane highway running through Deir Istiya´s olive fields. 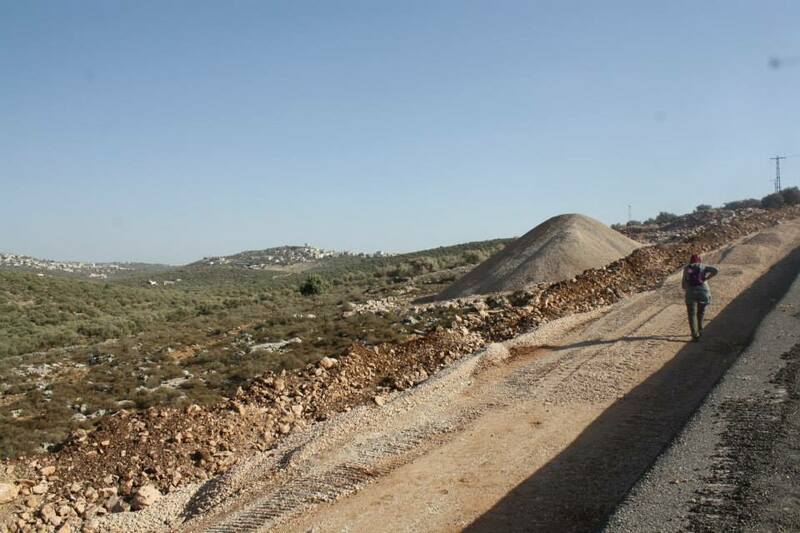 This is already a busy and dangerous road which was build without no consideration for the needs and desires of local Palestinians and which already claimed the life of a 45 year old Deir Istiyan, Abdul Muttaleb Muhammad Hakim. See IWPS report <http://iwps.info/files/2011/04/Tragic-Accident.pdf> . Mr Hakim was run over by a settler woman during the olive harvest in 2011. He was working his family land which Highway 5 illegally cuts through so that his land is situated on both sides of the road. Lessons have not been learned from Mr Hakim´s death. 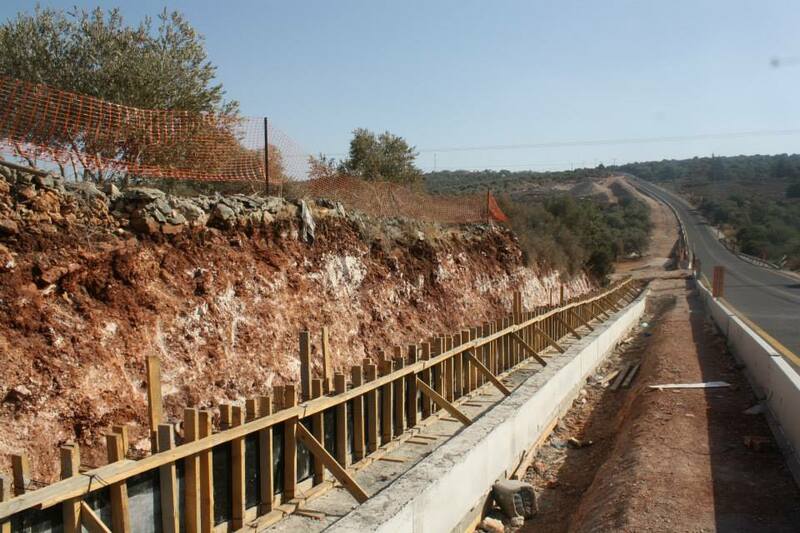 Widening of the road is likely to make it even more dangerous to cross and will certainly put more Palestinian lives at risk. 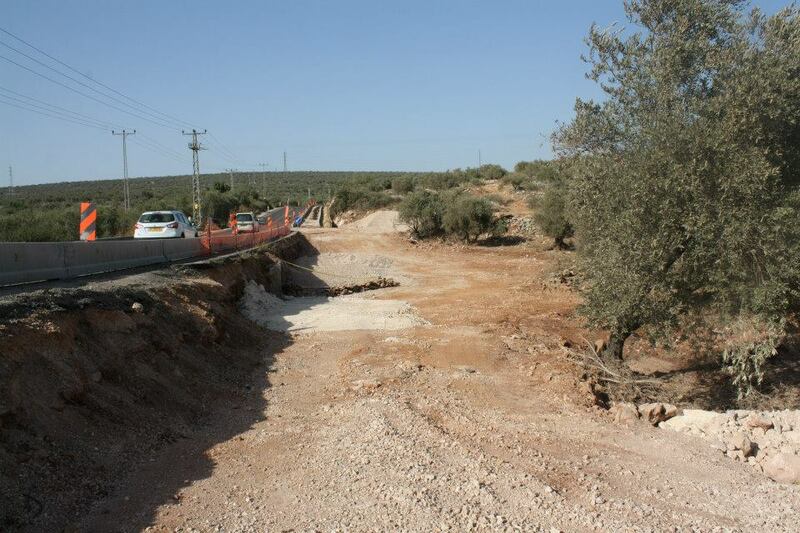 There was no consultation with the Deir Istiya village council about the road widening, despite at least 80 olive trees belonging to the villagers being removed to clear the space. Israelis did contact Deir Istiya authorities about the olive trees, suggesting that they be pulled out with their roots and replanted in other locations. Our neighbor thought that this could not work as the trees would need large amounts of water not to survive the replanting. The water needed is not available. We saw the holes where olive trees used to be. Our neighbor said some of the trees were ancient. 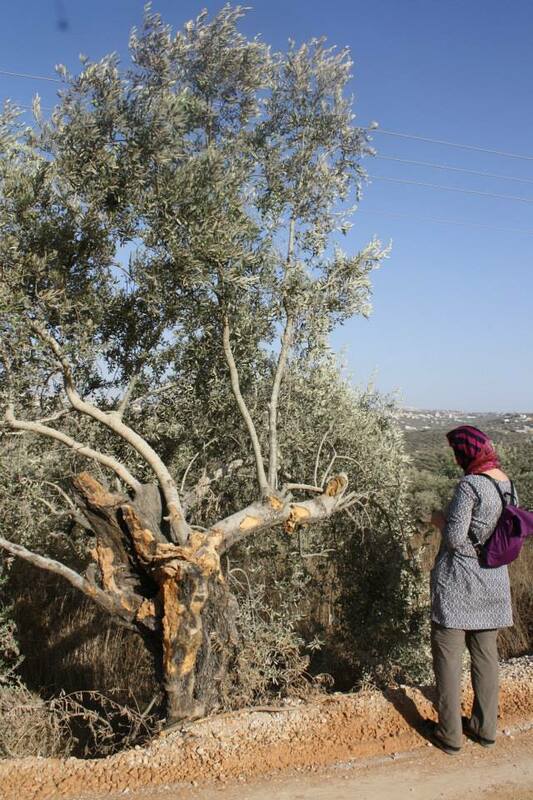 Unfortunately, the ease of travel of illegal Israeli settlers takes precedence over the needs of Palestinian farmers and their ancient olive groves. An additional number of trees were chopped vertically and others had roots embedded in concrete. It is expected that another side of the road will also be widened. That would make daily lives of the Palestinian owners of the land even worse and cause a destruction of many more olive trees. The Mayor of Deir Istiya told us today that four agricultural roads for the use of Deir Istiya farmers to cross the settler road have been closed for many years. The villagers have grave concerns about their safety when crossing the highway; the Mayor made repeated requests via the Palestinian Authorities who liaised with the Israelis to open the agricultural roads. Promises were made that the agricultural roads will be reopened before the start of the olive harvest season in couple of days time. 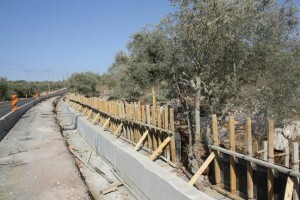 Farmers of Deir Istiya have already started to work in their olive fields but there is no indication that the promise about the roads opening will be kept.